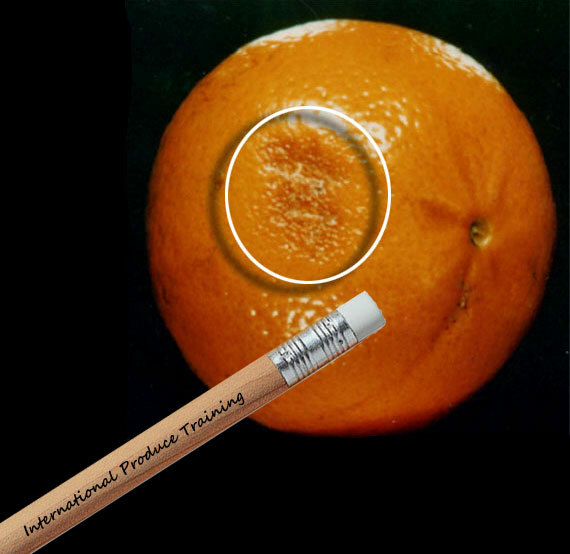 One of the most common defects of oranges is the defect called skin breakdown. This defect is caused by many different factors, including age, coloring, chilling injury, bruising, or any time the orange may lose some if its moisture and begins, resulting in sunken pitted areas. Skin breakdown may be found anywhere on the fruit’s surface, but is usually found near the stem end. The defect is characterized by sunken discolored pitted areas, but is still firm to the touch. The discoloration is usually a reddish brown color. Skin breakdown does not spread from fruit to fruit, but still hurts the appearance or its marketability. This defect is a condition defect, and is scored on a fairly strict basis. For oranges from California, the aggregate or combined area of skin breakdown may not exceed 1/4 inch, or about the size of a pencil eraser. For Florida oranges the area is a little larger, allowing an area of 1/2 inch, or an aggregate area of 7/8 inch. If you do find skin breakdown, you are allowed not more than 12% of the oranges with defects, including damage by skin breakdown.